Shandi Austin and Ryan Struzziery in Sophie McLellan’s play, “Room 404.” The RHS Theatre Guild entered Sophie McLellan’s original play in the METG Drama Festival on March 4. photo courtesy RHS Theatre Guild. 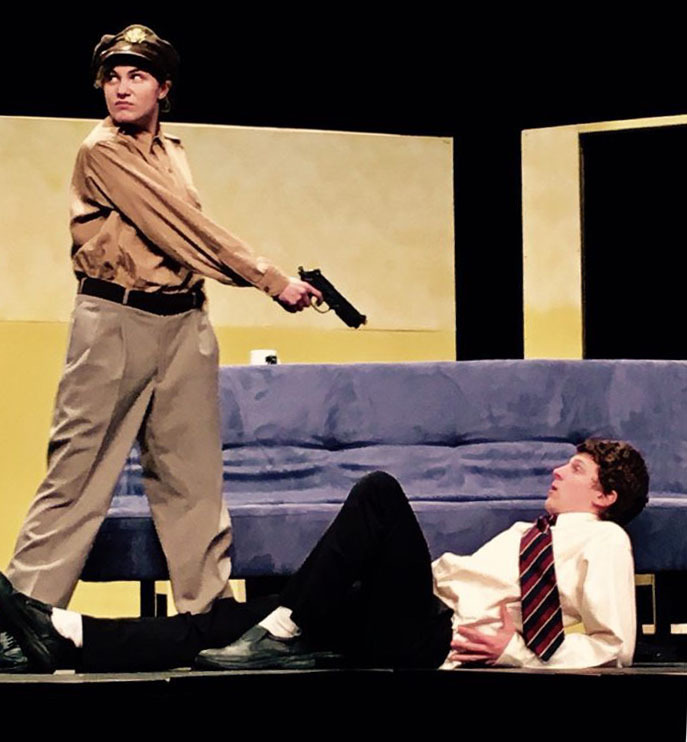 Norwood High School was the RHS drama troupe’s stage on March 4 for the annual METG (Massachusetts Educational Theatre Guild) Drama Festival. The METG Drama Festival is a competitive festival in which school theatre departments compete against each other with one act plays. 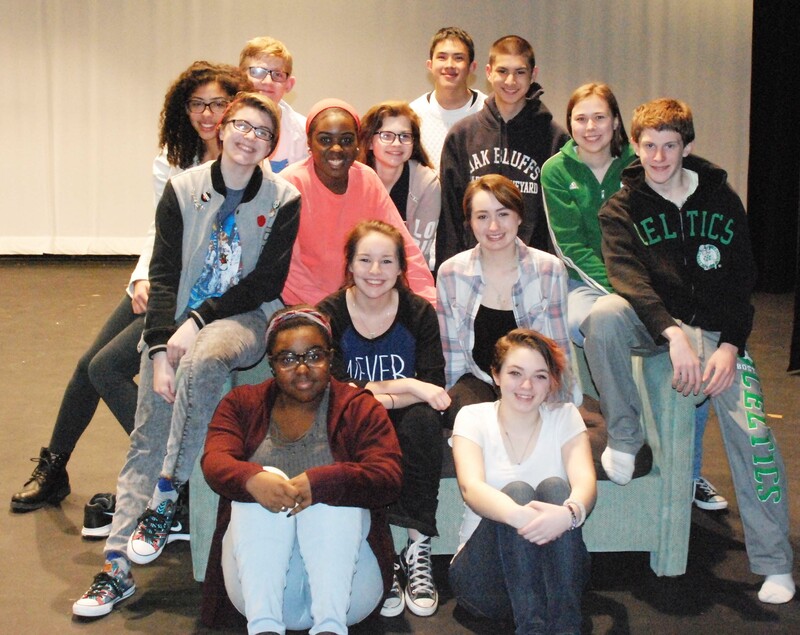 This year, Rockland performed an original play, “Room 404,” written by senior Sophie McLellan. “Room 404,” a murder mystery, surprised some of the judges and participants that night because it was different from what Rockland has done in past years. The senior says that her inspiration for the play came from “past ‘festi’ shows that revolved around death and murder that were dark, and also from watching the film, LA Confidential.” She says she has had the desire to write a crime-esque play since last summer. McLellan, who also played the role of Annie Miller in the play, says she had a amazing time this year at the festival, but that it was also bittersweet since it was her last year. The METG has had former participants come back to assist with the festival. McLellan, who plans to continue writing plays, said if she is successful in the future, she would love to go back and help out at the festival. Senior Angelica Pacombe, who was also recognized for her excellence in the portrayal of her character, Olivia Elswood, said she was quite surprised and excited to have been recognized for her performance. Pacombe enjoys the whole festival experience. “Festival is a time for people to express themselves in ways they can’t in regular drama, and also to be creative.” She admitted that her last year of the festival was sad though, because she realized it is her last year. English teacher and theatre guild co-advisor, Kendra Donovan, said that her second year of participating in the festival was great and went smoothly. She said that it was thanks to the help of the Dunns, senior Jurnee Dunn and freshman Neleh Dunn’s parents, who supervised rehearsals and helped to build the set, that she was able to enjoy her second year of experiencing the festival. She said she would definitely experience it again. However, she said, it all depends on her current situation of having a baby soon. She thought that Rockland’s performance was great and that the set was beautiful. She also said she was proud of the students. Norwood High, Scituate High, and Foxboro High School, with their performance of “The Chronicles of Jane: Book 7,” were chosen to advance to the semi-finals. Although the Rockland theatre troupe didn’t make it to the semi-finals, everyone who went to the festival this year gained valuable experience.